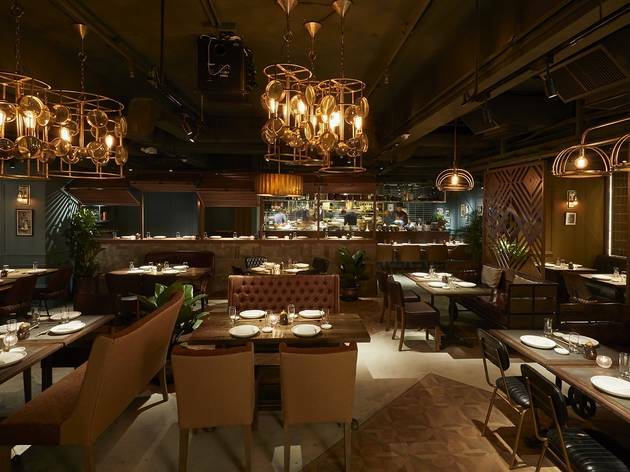 From Pirata Group, the gents behind Wan Chai’s Pirata and The Optimist restaurants, comes TokyoLima on Lyndhurst Terrace in Central. 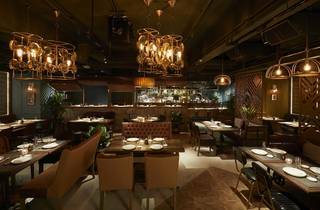 Serving the Japanese-Peruvian fusion cuisine known as Nikkei, this new eatery brings a plethora of qualities to Hong Kong’s dining scene that, we believe, have been sorely needed. Nailing the convivial atmosphere of an izakaya, TokyoLima keeps with the theme by opening until late at night. It’s been a while since our city saw a good joint like this that still serves in the wee hours and doesn’t just cook up kebabs. It doesn’t look like your average kebab joint either. Far from it, in fact. Greeted with a palpable-yet-ambient atmosphere, we first walk through the inviting bar space and into the main dining area. It’s spacious, with rich teal walls and an eclectic mix of chairs in various earthy brown tones. It’s also lit by steampunk-esque fixtures that hang from the ceiling, all exposed bulbs and magnifying glasses. 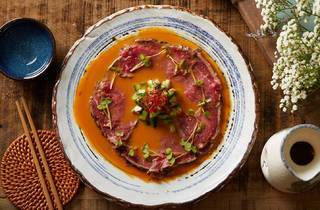 The surrounds don’t feel Japanese or Peruvian necessarily but, either way, we like TokyoLima’s ability to meld the casual and the classy all at once. We start with a little bit of everything. The la causa ($120) is chef Melendez’s take on a traditional Peruvian terrine. Layers of beetroot and potato mash, prawn tartar, garlic mayo and charred avocado are topped with a tempura prawn. Something as simple as mashed potato can often go horribly wrong and transport us back to our childhood days of Smash instant potato but, in this case, it’s done to buttery perfection. The tempura batter is also a champ. It’s light but boasts just enough crunch. 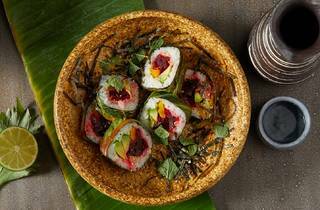 Rice-wise, the maguro and avocado maki rolls ($140) are a little sticky but they’re served with an addictive chili mayo that pairs perfectly with the tuna. 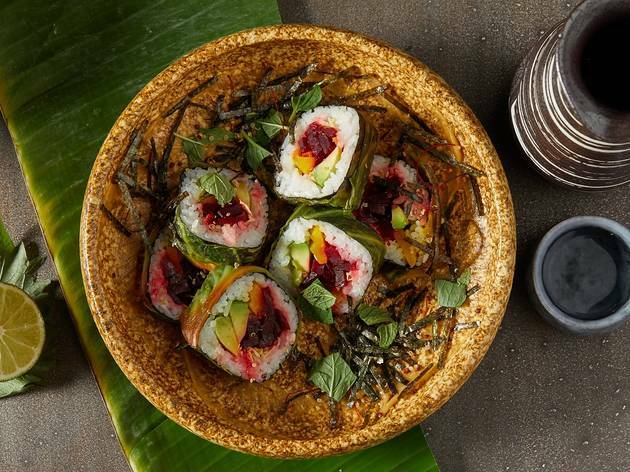 Assured by our waiter that the vegetarian futomaki rolls ($100) are his favourite maki rolls on the menu, we take the risk and they knock it out of the park. Cabbage, pickled beetroot, avocado and popped quinoa create a harmony of crunchy, crispy and creamy textures, complemented by miso mayo. Definitely worth the risk, even for carnivores. On to the meatier stuff, then. 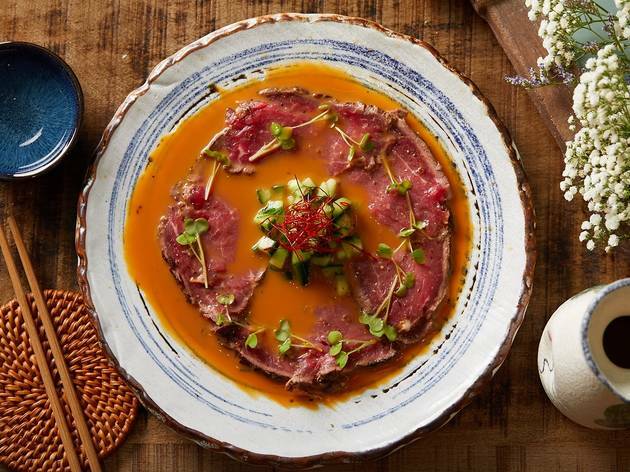 The beef tataki ($190) smothers lightly seared beef in yuzu and ponzu sauce. The sauce is addictively moreish with the citrus notes cutting through the brine of the uni and the thinly sliced meat is beautifully marbled. It melts in our mouths. The lobster acevichada ($360) is simply described on the menu as grilled lobster with chilli butter. But, simple though it may be, the lobster meat is bouncy and delicately charred. We end up spooning the remaining butter, with a hint of coconut, out of the lobster shell. After eating through our initial order, we’re well on our way to being full but can’t help ourselves ordering a portion of H&M ($130). No, not the shop. This is a hamachi and maguro sushi dish. And the generous portion of hamachi and maguro tuna slices doesn’t disappoint. The slices are married with a clementine dressing which is citrusy but not so acidic that it takes away from the wonderfully fresh fish. This really is Nikkei at it’s finest. We round of the savoury side of things off with octopus skewers served with a black olive tapenade, carrot puree and capers ($150). The chunks of octopus are outrageously tender and the salty tapenade is a great accompaniment. There’s just about room for dessert, so we finish with the ‘oye papi’ ($110) which is made up of chocolate ice cream, a brownie and some caramelised almonds. It’s nothing to shout about but it does make for a decent enough sweet end to what has been an excellent meal. The chewy brownie and chocolate is satisfyingly rich without being sickly. So, back to the plethora of qualities we were saying Hong Kong’s dining scene had been sorely needing. We may have some stellar restaurants across town but we think this is the first that sees the fusion of two quite diverse cuisines and stays open late for food (with no kebab in sight). Basically, to sum up: great food and drinks, friendly and helpful service, a bar and a restaurant worth visiting in equal measure, beautiful-yet-unpretentious surrounds, a great atmosphere punctuated by an eclectic playlist, late night opening hours and a menu bursting with a fantastic, underrepresented cuisine. TokyoLima ticks all these boxes with a roaring confidence. And considering it’s only been open just a matter of days, we can’t wait to see what the future holds.